Zimbabwe's President Robert Mugabe has made his first public appearance since the country's army took over on Wednesday. The military said on Friday it was "engaging" with Mr Mugabe and would advise the public on the outcome of talks "as soon as possible". 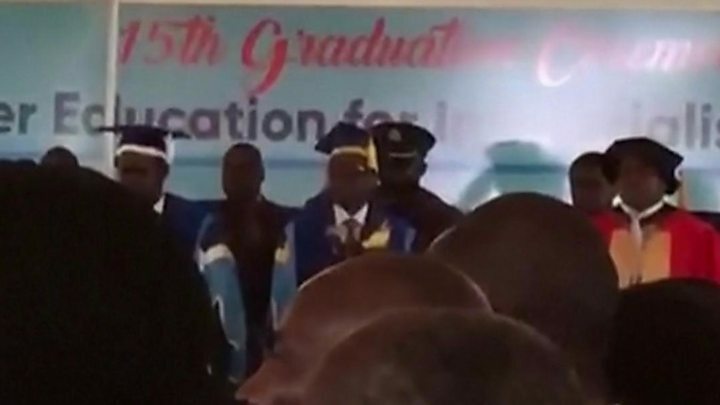 Mr Mugabe's attendance at the graduation is an annual tradition but few expected to see him there, the BBC's Andrew Harding reports from Zimbabwe. Mr Mugabe walked slowly up a red carpet and joined the crowd in singing the national anthem, then opened the graduation ceremony at Zimbabwe's Open University, where he is chancellor. 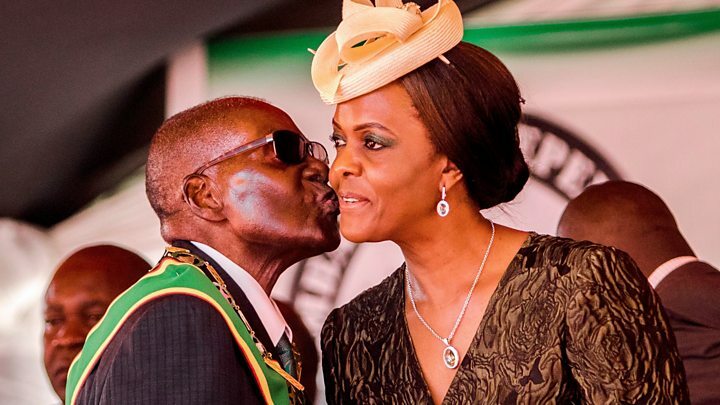 Neither the 93-year-old president's wife, Grace Mugabe, nor Education Minister Jonathan Moyo - an ally of hers whose house was reportedly raided by the military - were present. Mr Mnangagwa was seen as a potential successor and his sacking paved the way for Grace Mugabe - who is four decades younger than him - to take over the presidency instead. Media captionWho is Grace Mugabe? It was thought she had left the country but it emerged on Thursday that she was at home with Mr Mugabe. Although the army is obviously calling the shots in Zimbabwe, in public they still refer to Robert Mugabe as "his excellency, the president" and even "commander-in-chief". This is why he has been allowed to attend the graduation ceremony. This is partly to keep up the pretence that they have not staged a coup but they also have a genuine, deeply felt respect for him going back more than 40 years. All of Zimbabwe's security chiefs have worked with Mr Mugabe since they fought together in the 1970s war of independence - and the bonds forged in that struggle are difficult to break. In many ways, Zimbabwe's military remains the armed wing of Zanu-PF, as it was when they were all rebels fighting white-minority rule in the then Rhodesia. Furthermore, in Zimbabwean culture, the elderly are treated with respect and no-one wants to be seen to be treating a 93-year-old in an undignified manner, especially a man even opposition figures refer to as the "father of the nation". Military vehicles were spotted on roads leading to the Zimbabwean capital Harare on Tuesday, sparking rumours that something was afoot. Later, soldiers seized the headquarters of Zimbabwe's national broadcaster ZBC and loud explosions and gunfire were heard. Major General Sibusiso Moyo then read out a statement on national television, assuring the nation that President Mugabe and his family were safe. On Thursday Mr Mugabe was pictured smiling as he took part in talks with an army general and South African government ministers at State House but sources suggested he might be resisting pressure to resign. What's the reaction in the country? Zimbabweans have been posting on Facebook and Twitter that there has been no dramatic effect on normal life. People say that shops have opened as normal but there are few people on the streets of the capital. 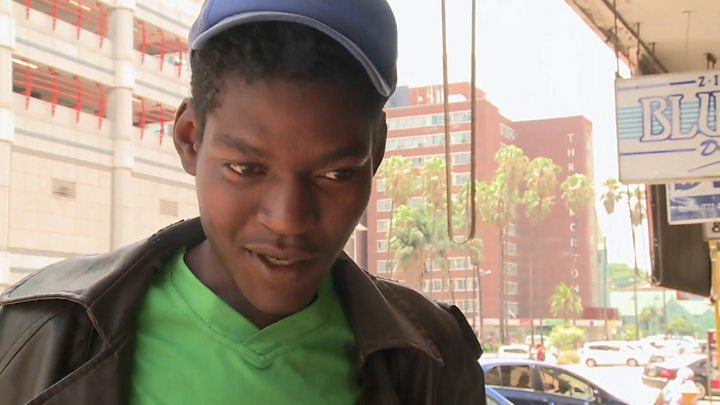 Some Zimbabweans spoken to by the BBC have welcomed the news, with one man expressing his thanks to the army for "taking out the tyrant". What has the reaction been across Africa? Botswana's President Ian Khama told Reuters news agency that regional leaders did not support Mr Mugabe staying in power, adding: "We are presidents, we are not monarchs"
Nigeria's President Muhammadu Buhari called for calm and "respect for the constitution", and said that every attempt should be made to save the country from "political instability"